Long weekends are always painful to journey across any part of the country. We always have lot of inconvenience during this period. What if, family spend a good peaceful time in the mid of forest with bunch of like minded family members! Undoubtedly, a great joy in mother nature. 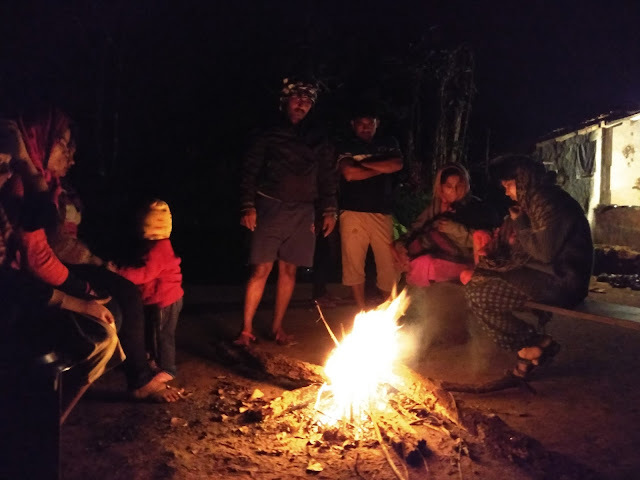 Yes, we had been a great time with family and friends during the Christmas long weekend of 23rd to 25th December 2017 at lap of Tadiandamol, the highest peak in Coorg [Kodagu]. I never get bored to visit again and again same places. The same I have mentioned many times in my blog. This Tadiandamol family visit is my fifth one; first one visited with friend sometimes in 2011 (Not available blog), second visit during family travel in 2013 (Not available blog); third visit with Bangalore Ascenders in 2015 and fourth visit last June 2017 during cycling around coorg. Every time, it is new experience altogether. 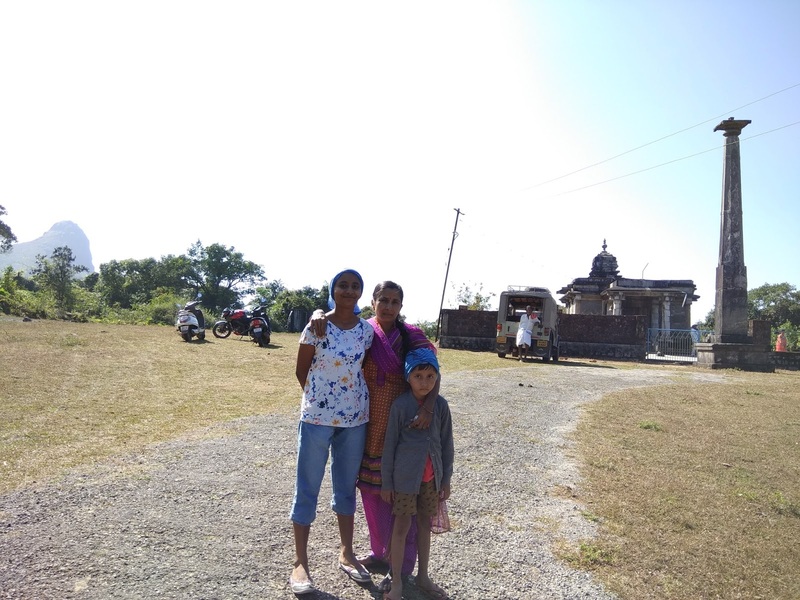 We expressed to spend at least two days with family and kids at Tadiandamol, during our cycling event. The location, old village home, hospitality, close to Tadiandamol peak factors made us to decide for perfect family camping. Yes, we knew, Christmas long weekend is not so easy to get accommodation, well in advance called Thammayya, the owner, a month before. Every alternate day, we kept on calling and reminded him about our arrival. Dates are finalized on 23 -25th December 2017, beloved friends Suresh Gowda, Shanthi Prasad and Sudhakar families are enrolled. In addition to this, I have invited my cousin Vagesh; Shanthi Prasad to his cousin Bahubali. The headcount is reached to 21 members [15 Adults + 6 Kids]. Preparation went well. Assigned the responsibilities and purchases according to needs. Everyone accepted voluntarily all tasks. The moto of this family trek is, to make Women and Kids relax all days, Men have to take entire responsibilities. 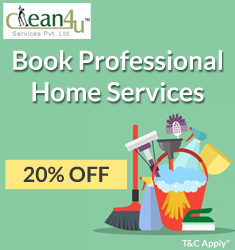 It involved, cooking, cleaning, purchase, arrangement etc. 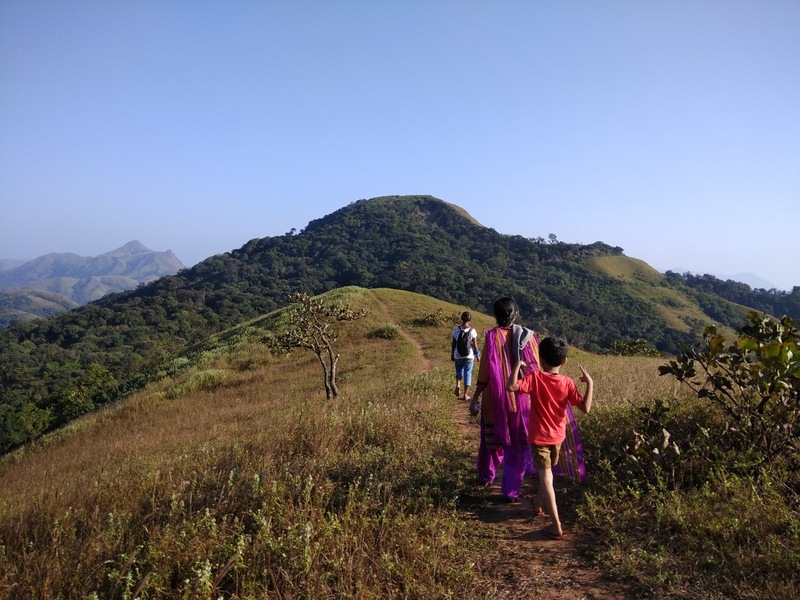 We wanted to experience the real trekking to family. At last journey date arrived; traveled by our own cars (4 Nos.). There are two reasons to travel in our cars; first one is, long 3 days stay and second one is traveling from different places. 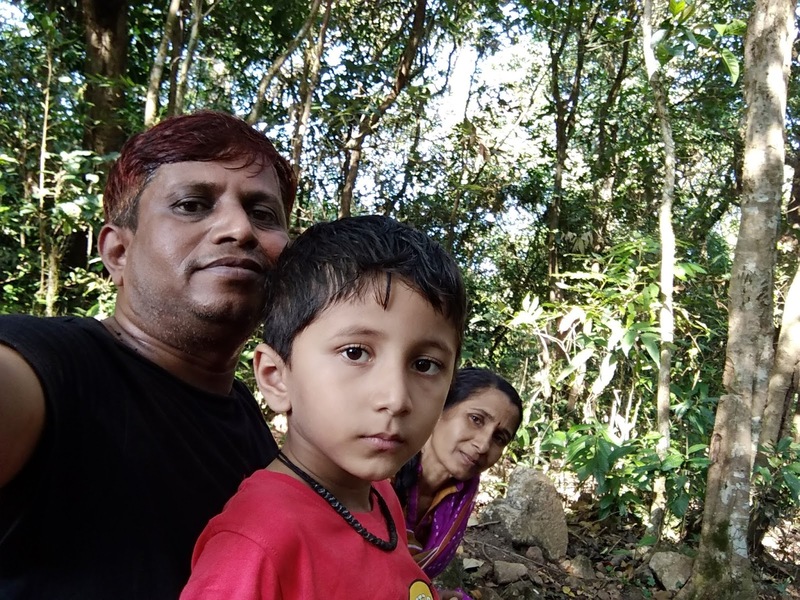 I started my journey from Muniyalu, on the way picked up cousin Vagesh family from Dharmasthala. They reached Dharmasthala by overnight journey from Bengaluru. Other team started early morning from Bengaluru. 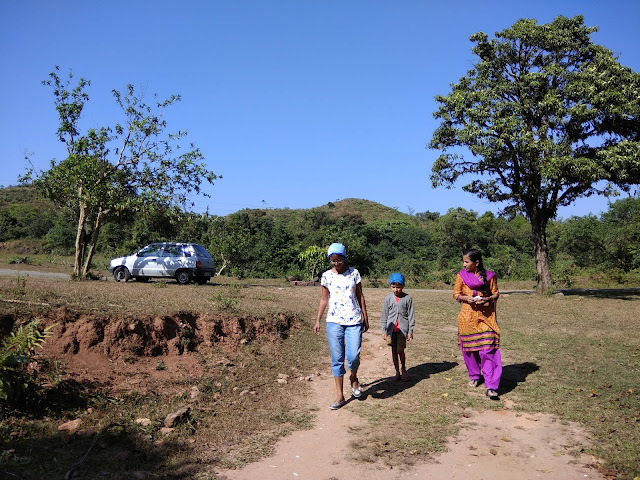 We reached the parking lot of Nalakhand Palace on 23rd December 2017 afternoon around 3 pm. We have to travel in Jeep from this place to Thammayya home, since tough terrain to normal vehicles. Hired Jeep for two round considering the luggage and members. There was a big food list for three days stay; many are experienced cookers. Sudhakar taken the entire responsibility to list out the grocery and food menu. It was inclusive of Bhelpuri, Awalakki, Soup, Coffee, Bisibelebath, Anna – Sambar, Payasa, Uppittu, Snacks etc. Thanks to main cooks Shanthi Prasad, Suresh & Sudhakar. The first expression of the members is wow!!! 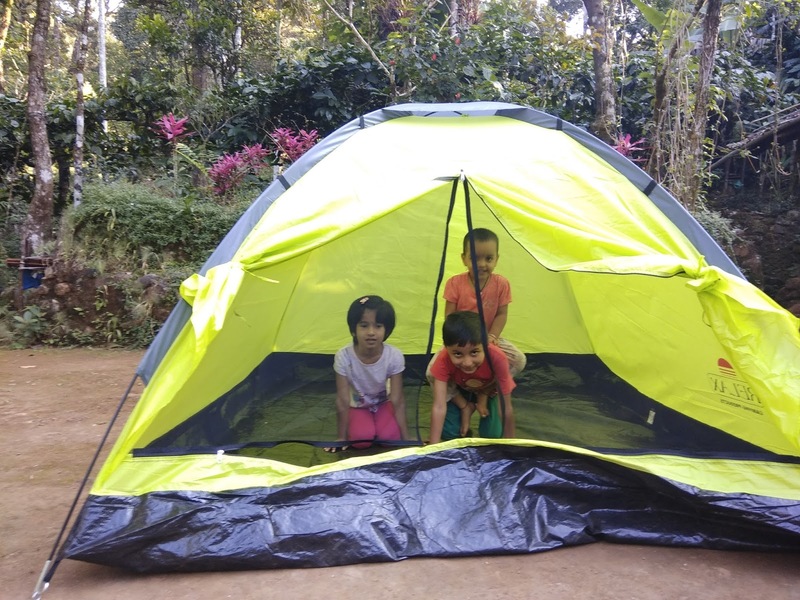 by seeing the camping place, all are very happy. Day – 1, we kept relax session to all and explore more around this beautiful home. Everyone is busy in their own world. The entire home is whispering by kids. Home was looking like any function. Day is ended with yummy dinner followed by camp fire. Second day is started with yummy Awalakki breakfast. Today is the real challenge to all. 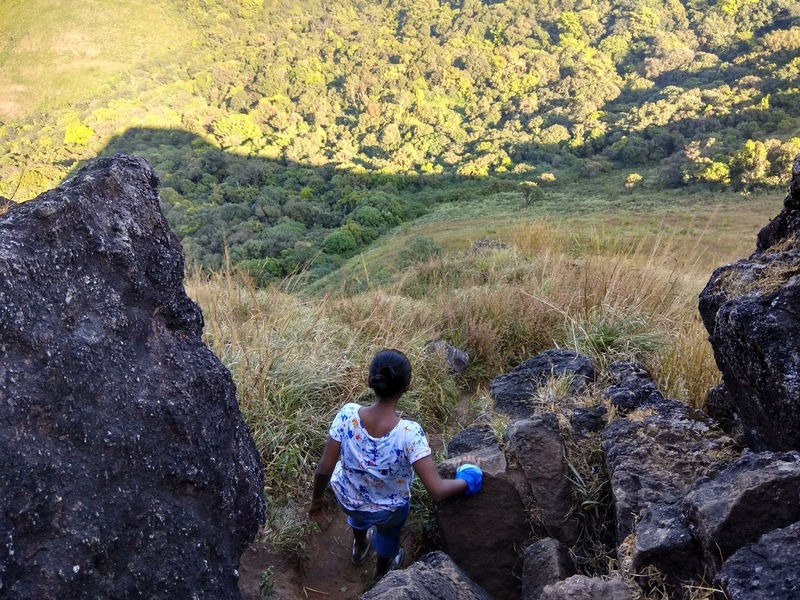 We decided to hike the Tadiandamil peak. 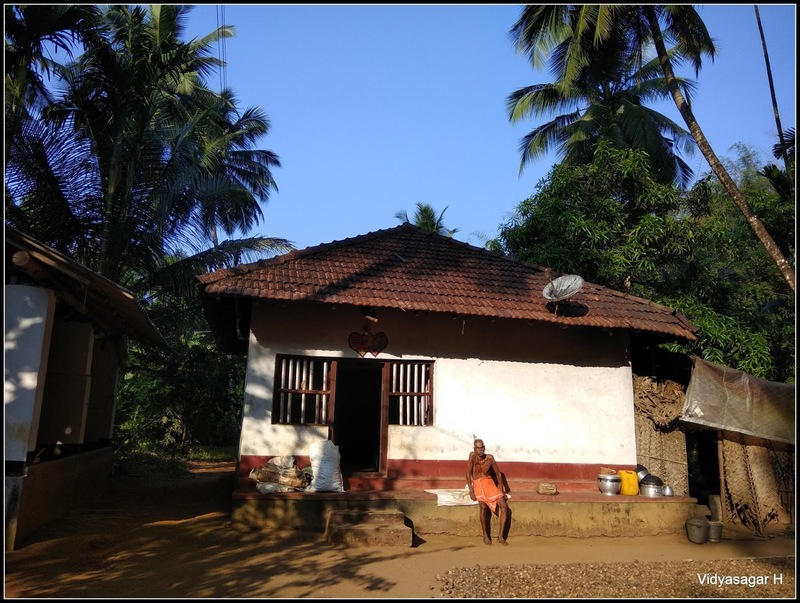 The distance is around 4 KMs from this home. Briefed about the trail to the team. Asked them to retire wherever they feel difficult. The journey started by paying forest entry fees. It is quite surprising to see the spirit and stamina of the team. Women and Kids are more charged than us. 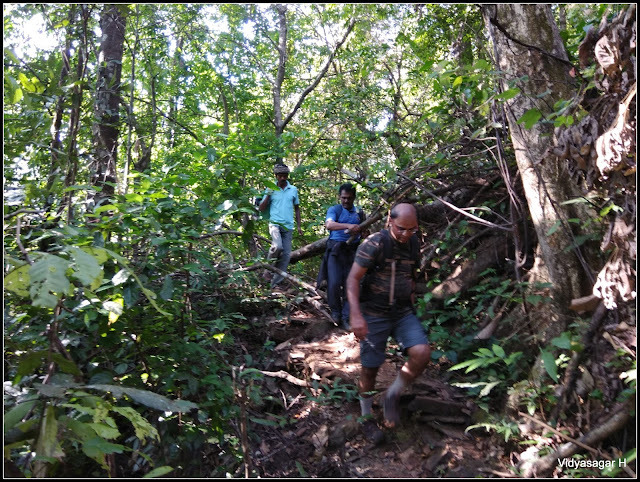 it is not so easy to trek the difficult trail around 2KMs steep ascend. 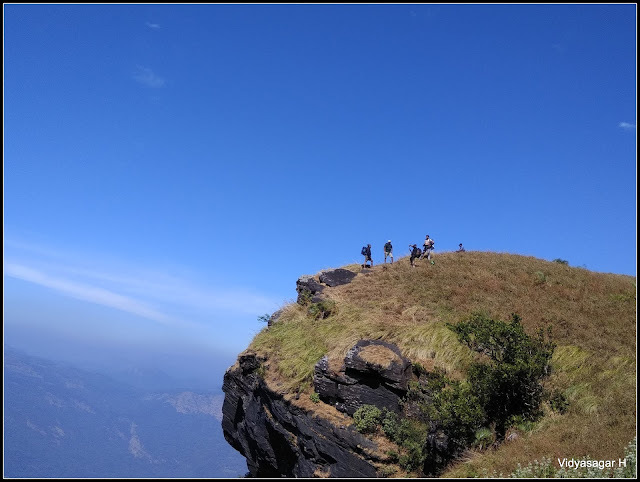 They have proved us wrong; we thought somewhat the half of the team may stop in mid; but the entire team hiked the Tadiandamol peak. 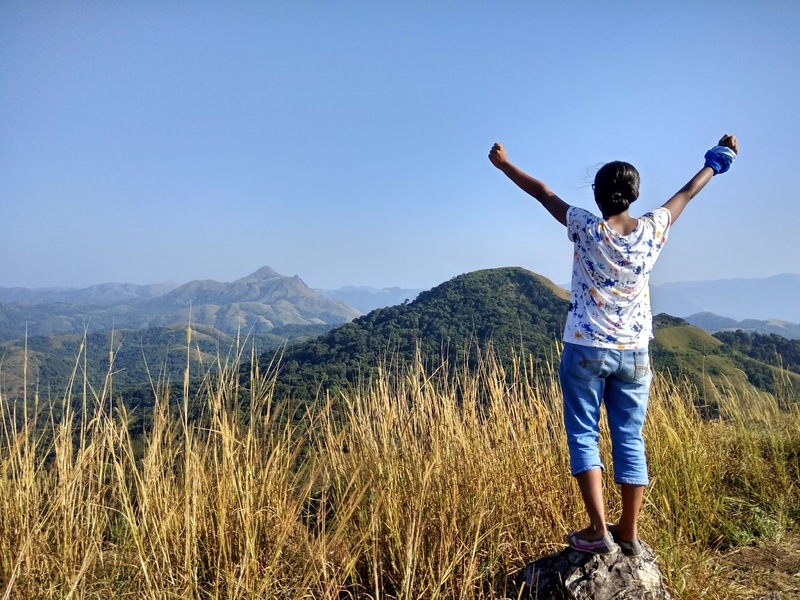 It was quite surprise and proud to kids – women, who hiked and enjoyed the trek. The main disappoint thing is, the crowd is unbelievable. 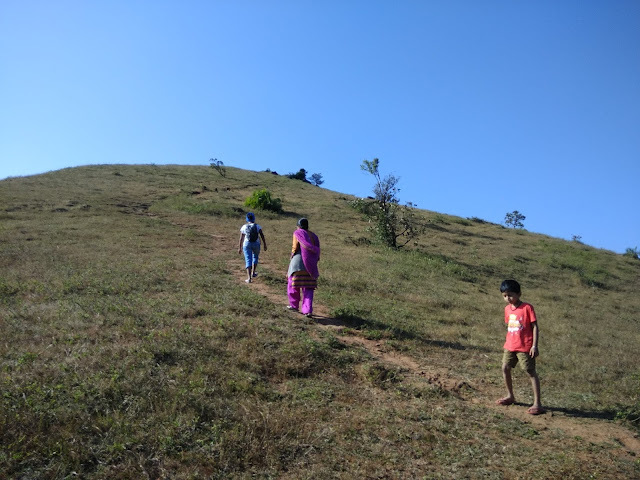 The entire trail was looking like hill marathon. Spending some good time on the peak, started back to the base camp. The valley was so beautiful except the heavy crowd. Taking multiple small breaks reached home. Team wanted to relax for sometimes. Evening prepared yummy Bhelpuri followed by coffee. Team members were engaged in their own world. Kids and men are busy in play, women had their own fun and exploration. Night we prepared the Payasa and Anna – Sambar. We not knew how soon we passed two days. 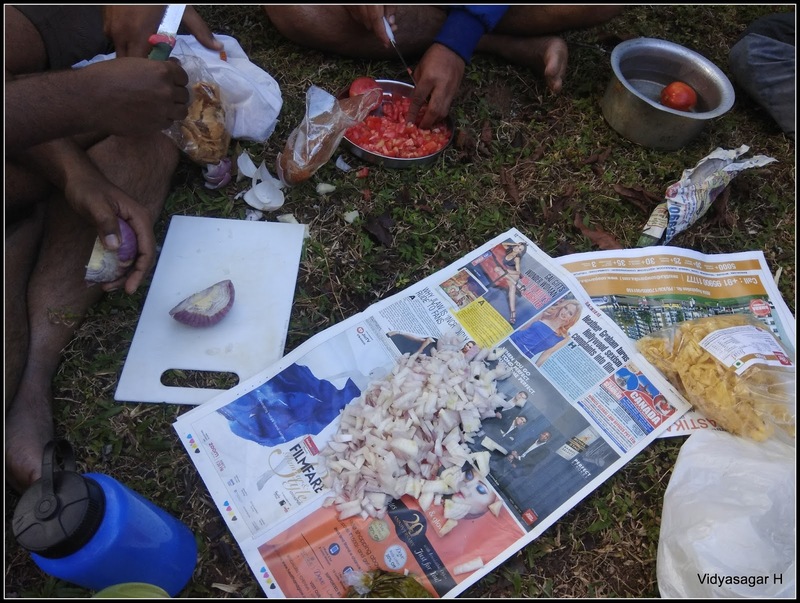 Men were completely engaged in the preparation of food and arrangements. The last day is about to pack-up. Team is busy in preparation in back-up. Prepared the Uppittu and coffee. The photo session went long way. Now the time to say goodbye to all friend and family. The dream family camping in the wild is over. We have put lot of efforts and time to make it success. A good new experience to family. We were so relaxed in all these three days. Thanks to each one of guys who helped to make it success. Hoping to meet again soon at some other wilder place. 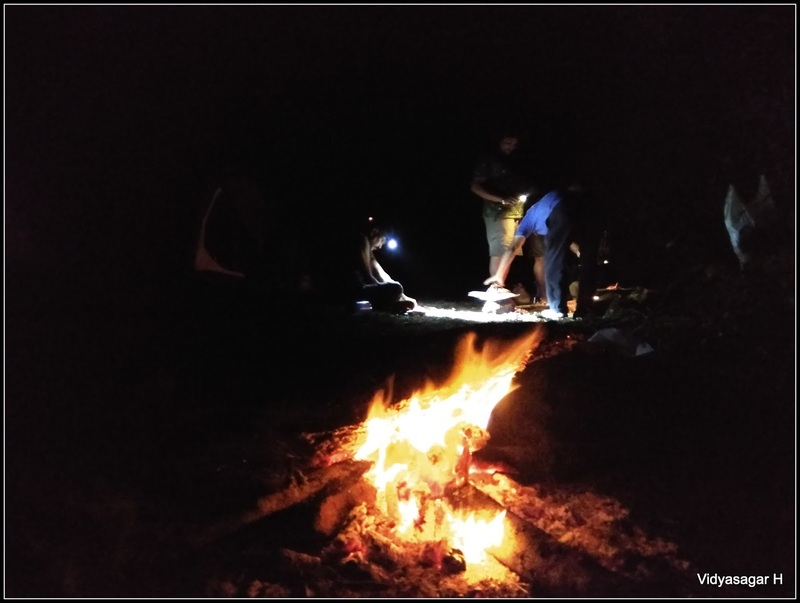 After a long time, it was an opportunity to do real trekking with carrying the entire baggage, camping in the wild near stream, away from the civilization, starting to ending of the trek there is no any civilization, preparing the delicious food, spotting the Elephants and finally fun-filled event with lovely group of friends. 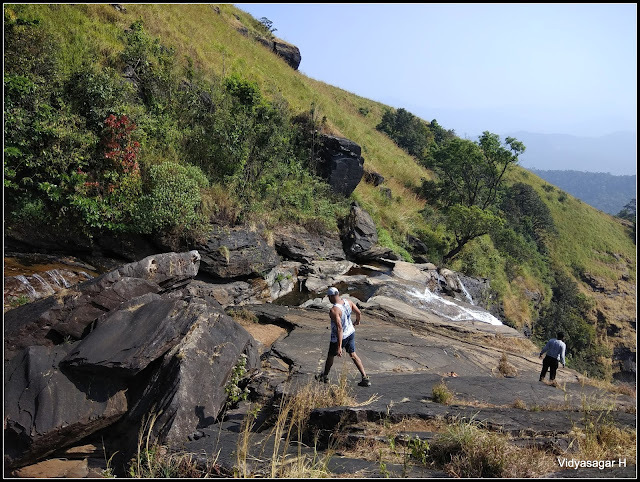 The Bandaje Arbi falls trek on 16 – 17th December 2017 with friends. I had been this place in summer, four years back in the year 2013. 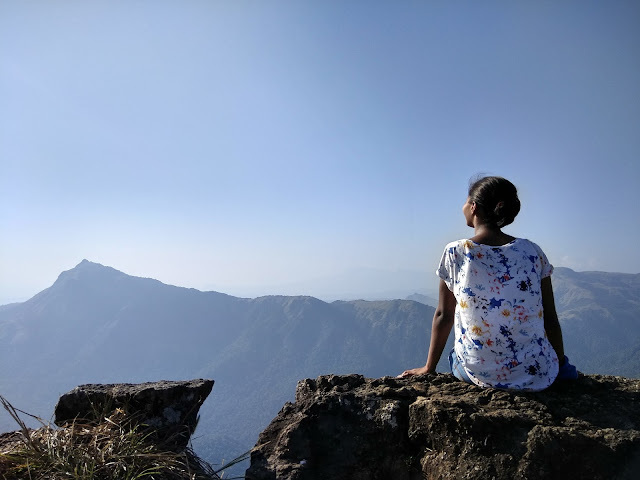 In my view, every trek is different, even though I visited repeatedly. I never felt bore and am very eager to visit again and again. Bandaje trek was pending since long time. 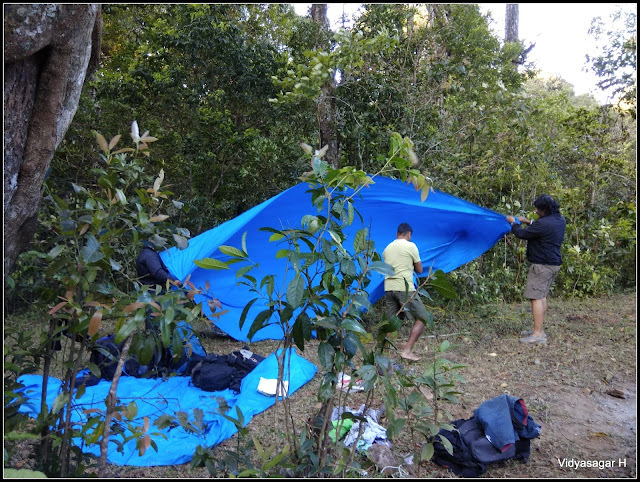 Many time we mentioned to do, but finally we ready when the Amedikallu trekking permission is denied by forest officials. The golden memories of 2013 recalled about how we survived the scary night. At last we could able to manage the 10 members group. We enjoyed the Tempo Traveler journey. The extra vacate seats gave comfortable journey to all of us. The early morning fresh-up at Dharmasthala is ideal place to the huge group. We got an enough time to get ourselves refresh and casually move to Ujire for breakfast. Hotel Guruprasad yummy breakfast filled our stomach before starting the trek from Bandaje village. I completely forgot the trail, not remembered much. 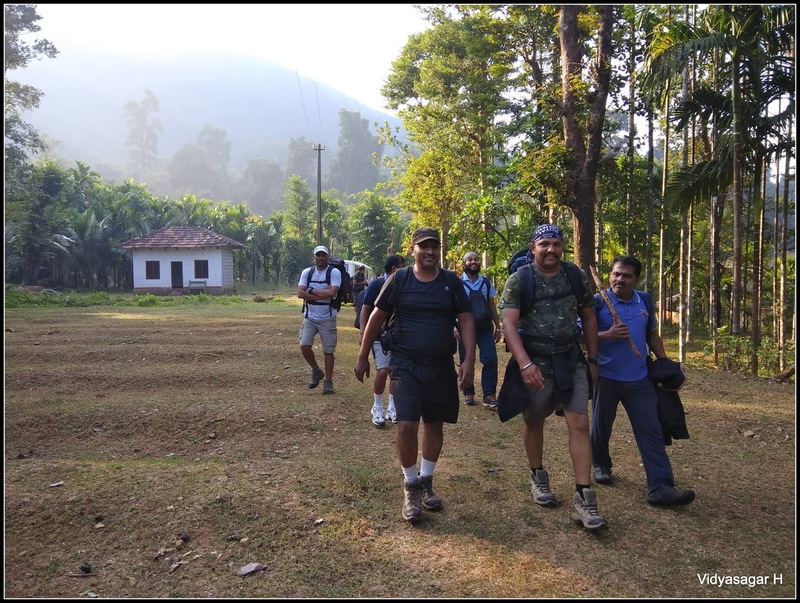 The reason could be, not much concentrated on the trail than enjoying the trek. Initial trail passed through small two villages and soon hit into the thick forest. Definitely, I am disappointed by seeing the crowd, it was just like marathon. There was bumper to bumper traffic in the jungle. Not sure, may be more than 200 people. The marathon is continued with nice photography. Trail as such not so easy, however we enjoyed the trail in shade. 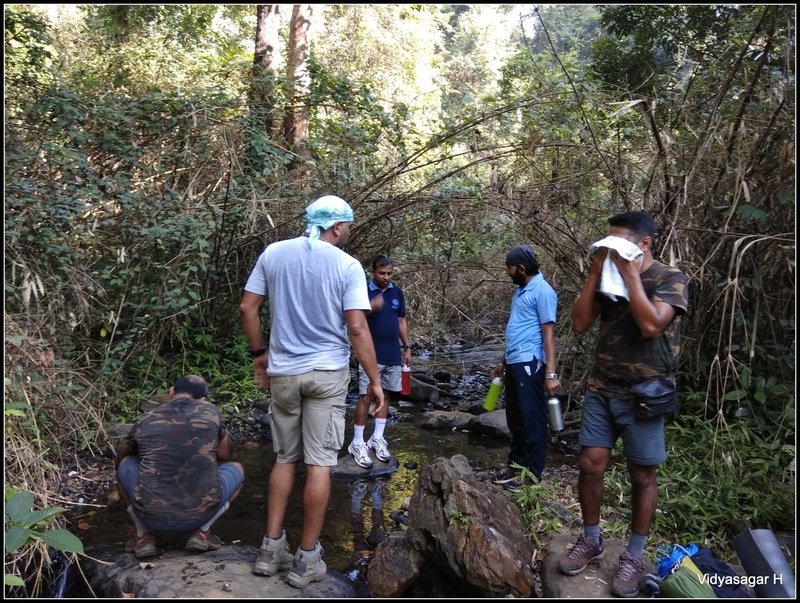 We came across two streams, re-filled our bottles and stomach with snacks. Journey is continued. The grassland trail is very tough as usual. 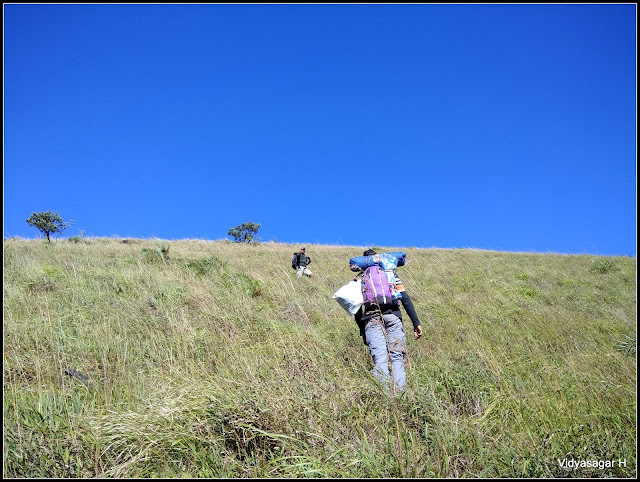 Open to sunburn, very difficult continue ascend will test our stamina. 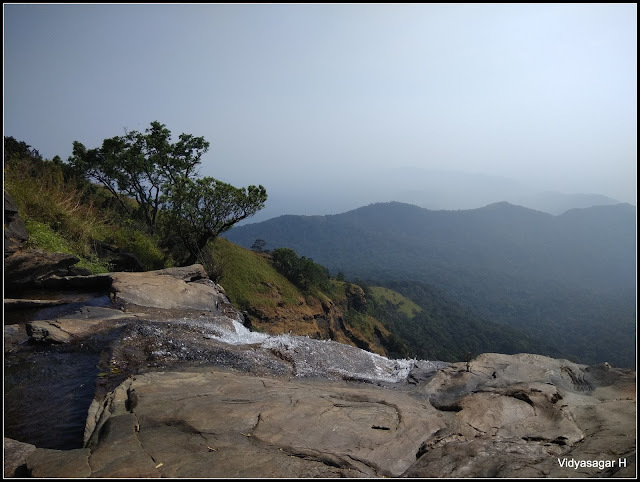 Taking many more pit stops, reached the Bandaje Arbi Falls around 3 pm. We avoided taking lunch till to reach the falls. 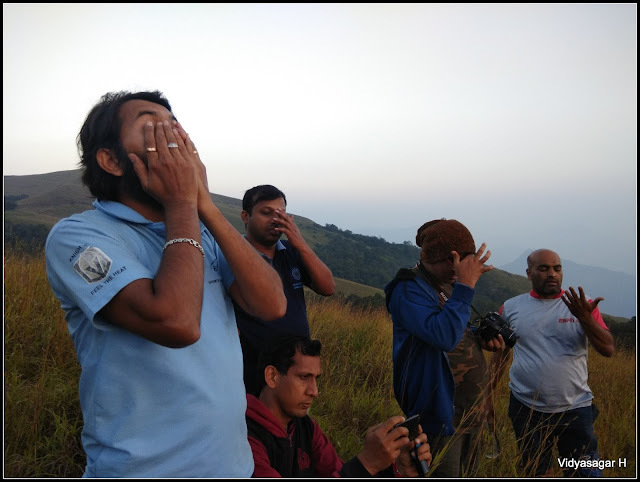 It's not so easy to hike with filled stomach. The falls area already occupied with many trekkers. Luckily our lead Santosh and Gang explored a new camping site which was another a KM far from the falls. Chilled ICE water falls tempted us to jump in. The swatted body badly wanted to dip in the water even though mind stopped us. One by one jumped in the stream and enjoyed the ICE Water bath. Homemade food eagerly waiting for us, not relaxing single minute, filled our hungry stomach with yummy homemade food. 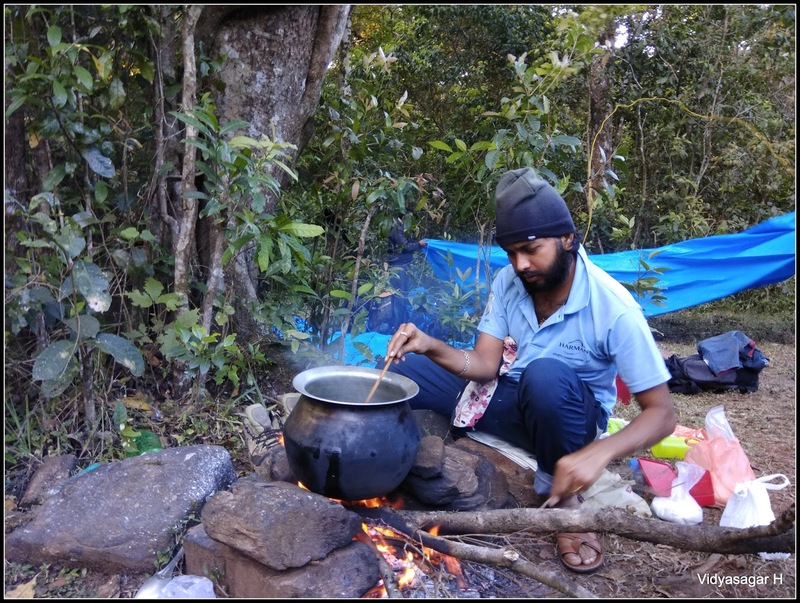 Yes, always first preference in the trek is homemade food. 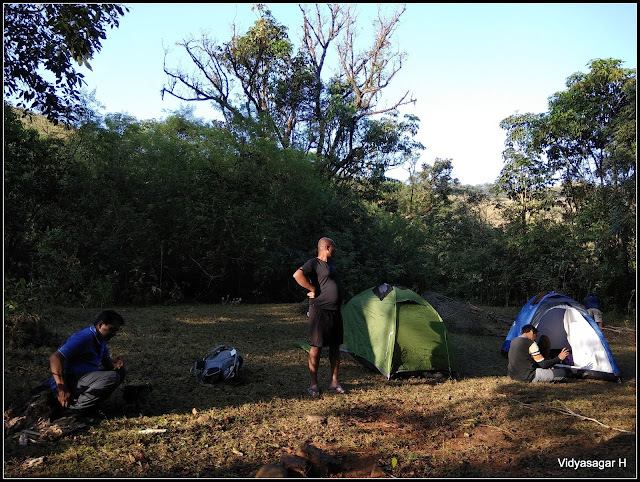 Thanks a ton, to Santosh and team who really explored a wonderful place for camping. It was completely away from the crowd, very close to stream. The place is really so beautiful and ideal for camping. Already the first batch was relaxed and taking rest. We too joined with them, arranged the campsite, prepared the tarpaulin tent. Of course, the God will not leave us so happy to enjoy this beautiful place. What to say not understanding! An OX is irritated a lot the first batch while having the lunch. 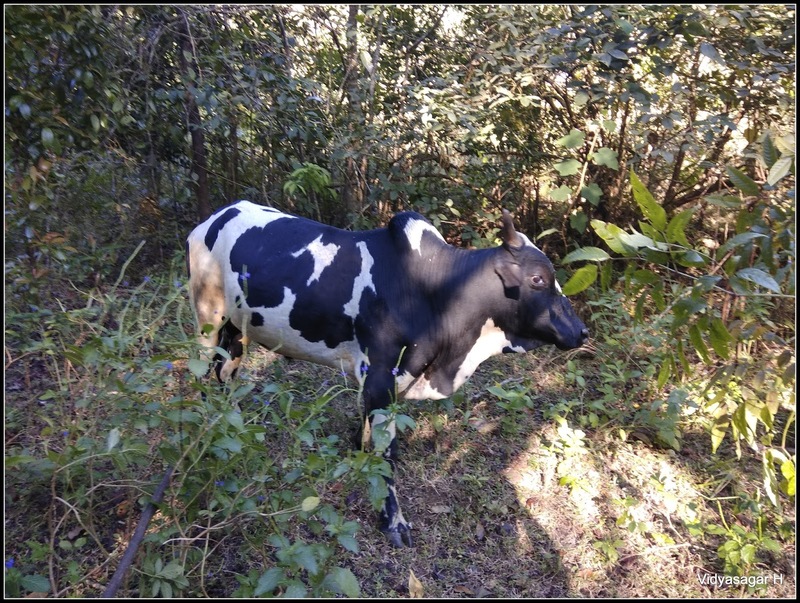 It was still roaming around the campsite and not allowing us to do anything. A person engaged to watch the OX. Believe me, it had not allowed us to sleep proper in the night. Our food list was big, first we prepared the Bhelpuri. Unlimited Bhelpuri filled our stomach and relaxed sometime later soup is combined the match. Few of us wanted to view the beautiful sunset. We had very less time, running we reached the point and enjoyed the amazing sunset. 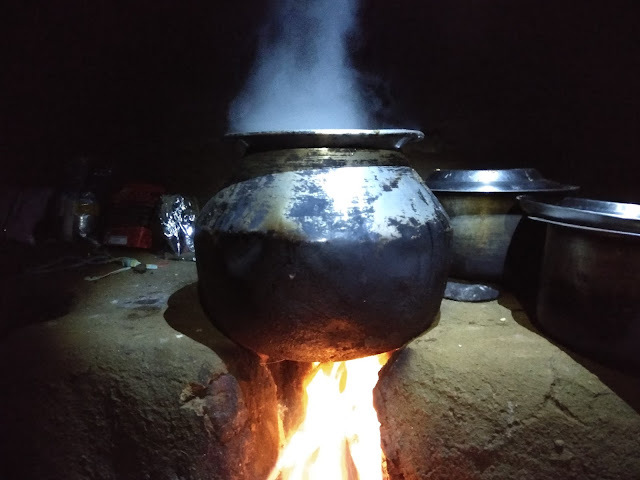 The team was busy in preparation of dinner, PONGAL. Thanks to Manjunath and team, who voluntarily came forward and served us the delicious food. Meantime rest of the members were busy in singing around the fire-camp. The day is over with yummy Pongal and unlimited fun of the day. Night not went well, OX gave lot of trouble. We ourselves engaged in preparation of Avalakki breakfast and coffee. The hike was less, so relaxed we moved from campsite. The team were disbursed in different small groups. Myself, Chandru & Ashok were in last. We saw bunch of Elephants just very close to our camping site. 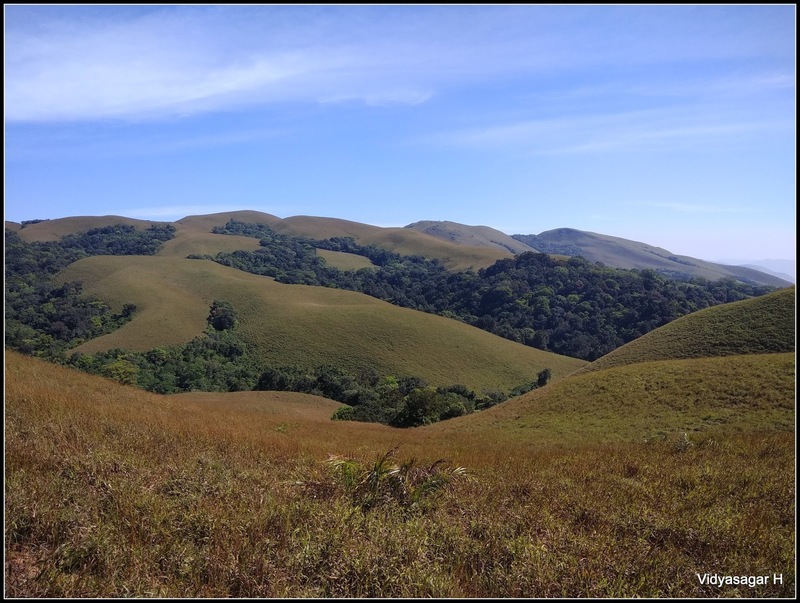 Second day is again open grassland hike, not much in the thick forest. 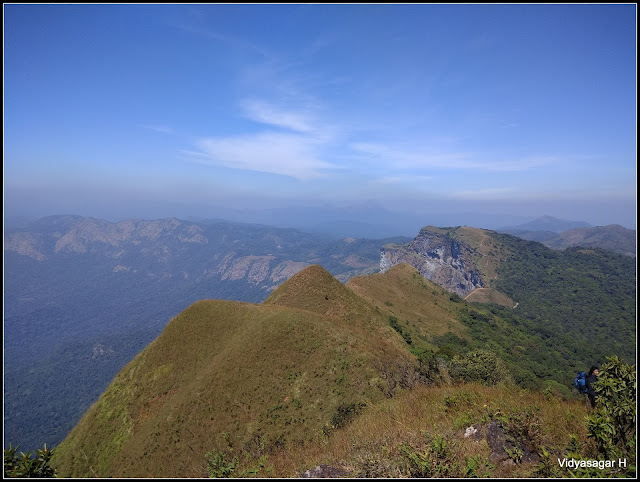 The beautiful 360degree valley can enjoy. It will be festival to our eyes in monsoon, however not disappointed now. We took deviation from the normal trail, and decided to do ridge walk. Scary ridge walk added more adventure to our trek. Ballalarayana Durga crossed and continued our journey towards Sunkasale. The day was really relaxed and reached the exit point. TT was waiting for us, boarded and continued our journey to Bengaluru. 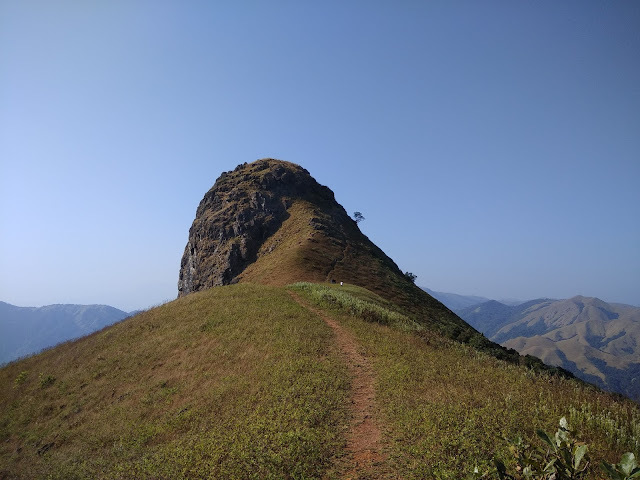 One more memorable Bandaje tough trek added in my list. 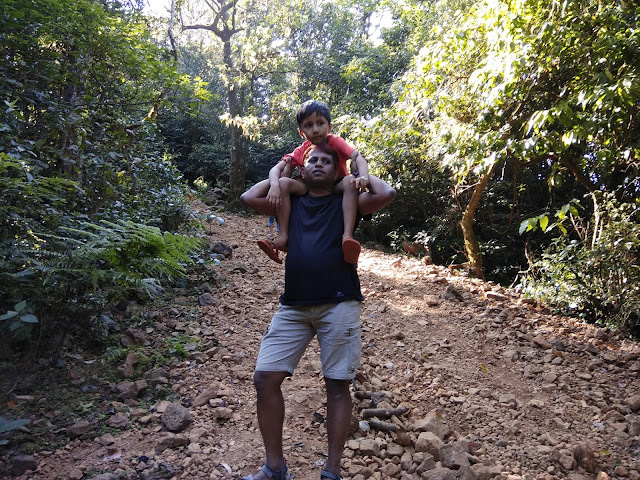 The joy is double when kids start showing interest towards nature; when they start to cultivate hobby like me about trek; they braver to walk with me in the forest; they love to enjoy the silent wilder valley; they get motivated to do more and more treks with me. 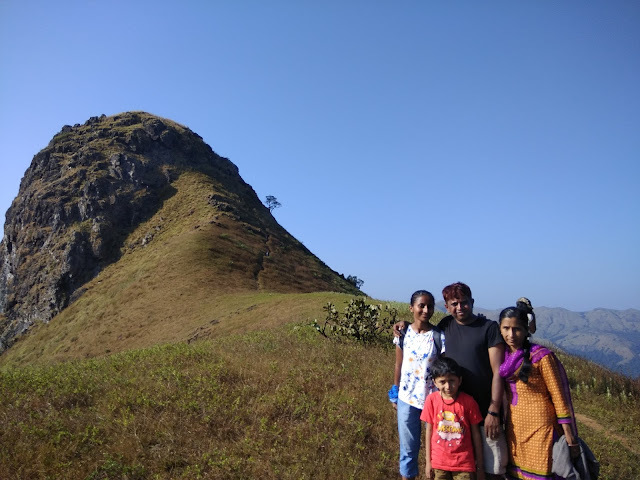 Indeed, a wonderful family trek to Ettina Bhuja on 8th December 2017 which ended a quote with my little son "Which is the next trek, APPA?" 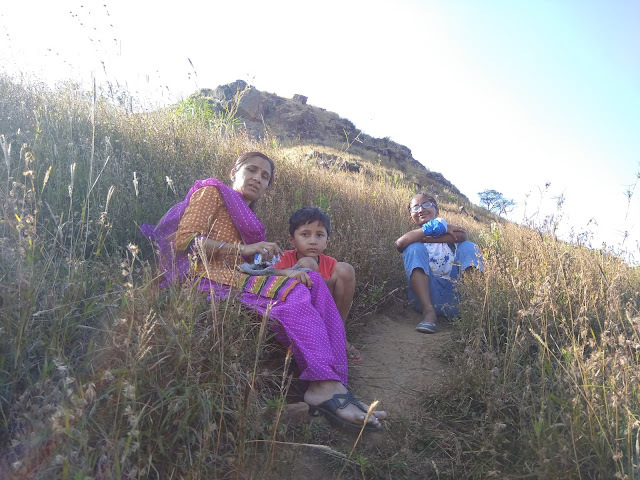 A special request from my little prince and princes to take them someplace for trek. I was just shuffling my mind to source a good place. Last month, I had been at Jenukallu& Deepadakallu Gudda trek, flashed my mind to get the family once to this beautiful valley. The time was not so far, within a month, I got an opportunity to travel with family from Muniyalu to Kolar. Always wanted to take an extra advantage travelling by car. Never traveled the same route except some urgent task. This time I took an opportunity to take family back through Sakaleshpura – Moodigere interior routes. 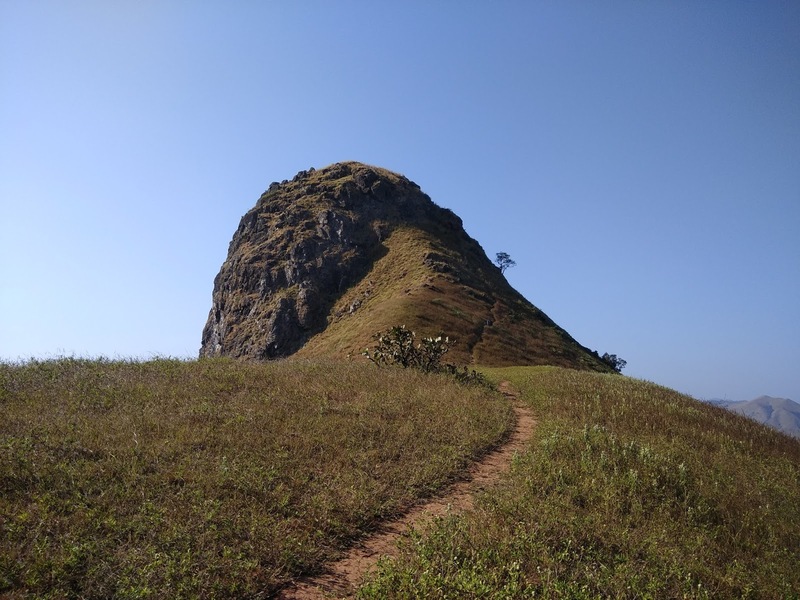 My main intention to postpone a day return journey to explore the Ettina Bhuja. 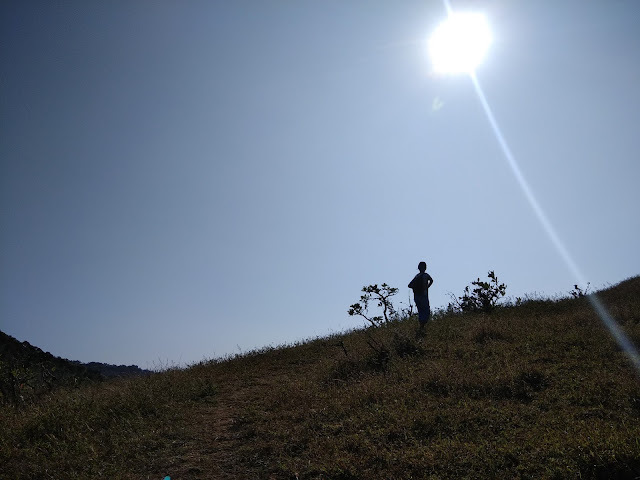 Planned to start early morning from Bengaluru and cover so comfortably the trek. 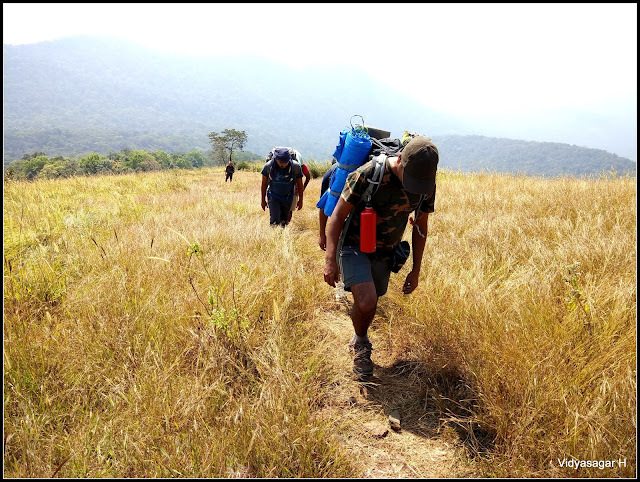 My son was more eager to start the trek, all the way he not spared me know the distance every minute. The innocent questions just made us laugh. 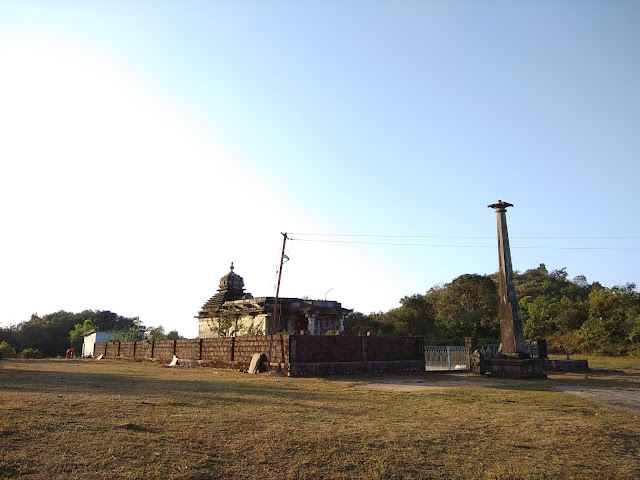 As per plan, reached the Ettina Bhuja base point Sri Nanya Bhaireshwara Temple around 2.15 pm. When we reached the temple, few devotees were present. 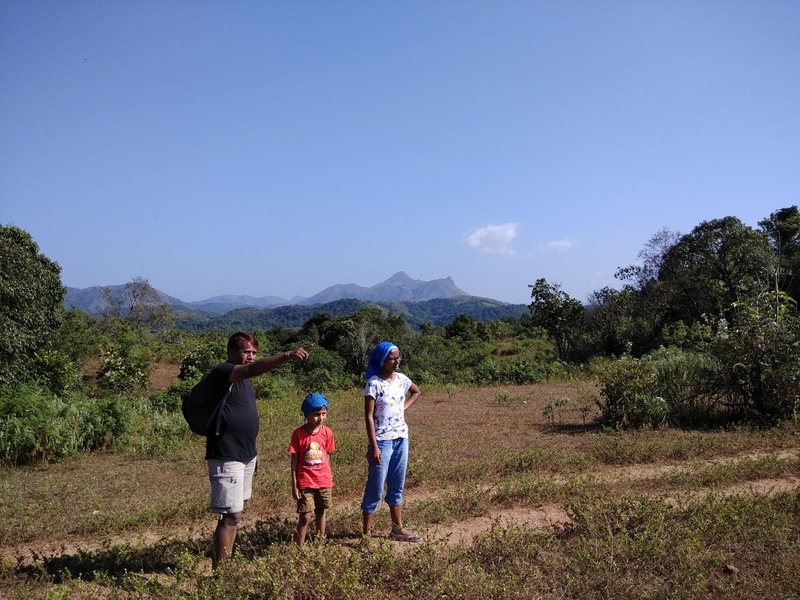 The Ettina Bhuja is clearly visible from this place. One of the elder informed about the distance, trail and level of difficulty. He suggested us not to venture, since it is forest and steep hike. I am very thankful to Blogger Friend ‘Ananth’ who cleared my all queries over mail. Quickly we are ready to start journey to hike Ettina Bhuja. There were two bikes parked; heard some noise from the peak; we ourselves satisfied about people present on the peak. The initial trail is jeep track, which drive through forest. Hope in the peak monsoon bit tough to trek on this trail. 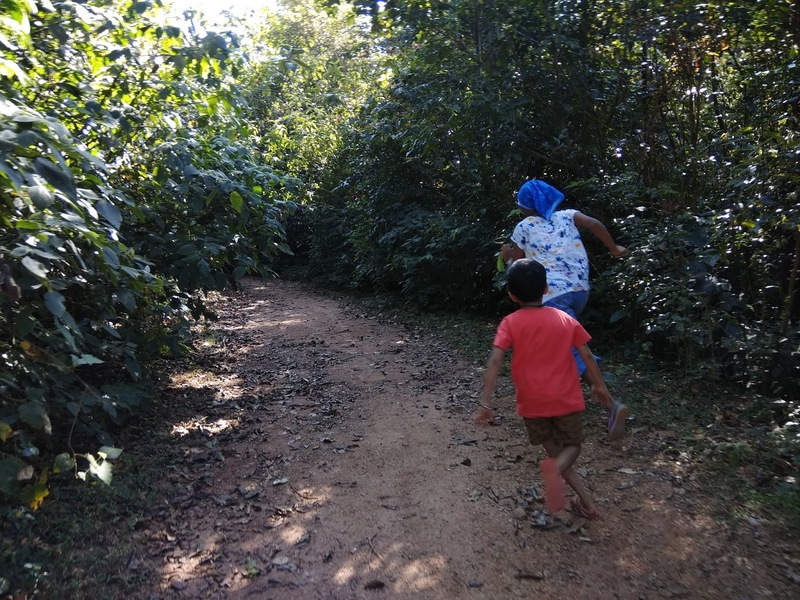 My son and daughter started enjoying the trail. Passing through the deep forest entered the grassland. We came across few travelers who were going back. 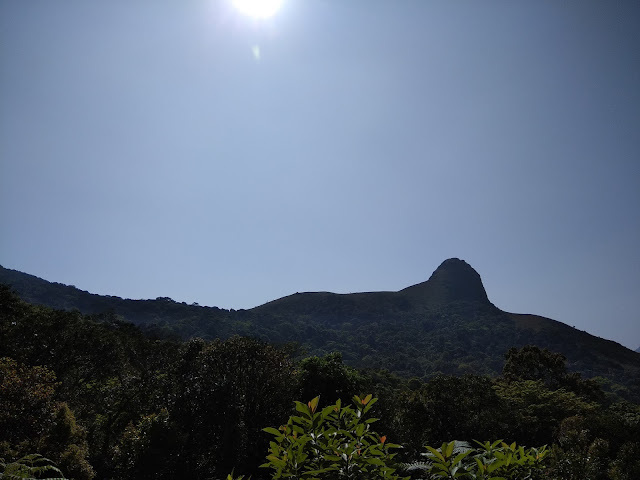 They advised us to come back soon and warned about the lonely peak. We found Elephant dung all the way, it's witness the presence of big mammal. Just, I was helpless to reply when my son asked so innocently “Appa, can you get me the real Elephant? It will help us our routine daily work. When you will buy for me? Where we can get it?........etc.”. Not to disappoint his innocent queries, replied in the same manner. 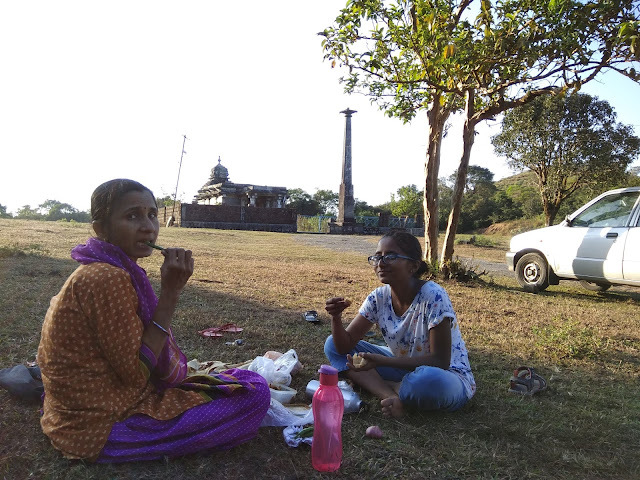 Taking two small breaks, we reached the Ettina Bhuja. The entire valley is so beautiful. I have introduced the different peaks to all. We can see far away Jenukallu & Deepadakallu, Amedikallu, Ombattu Gudda range. 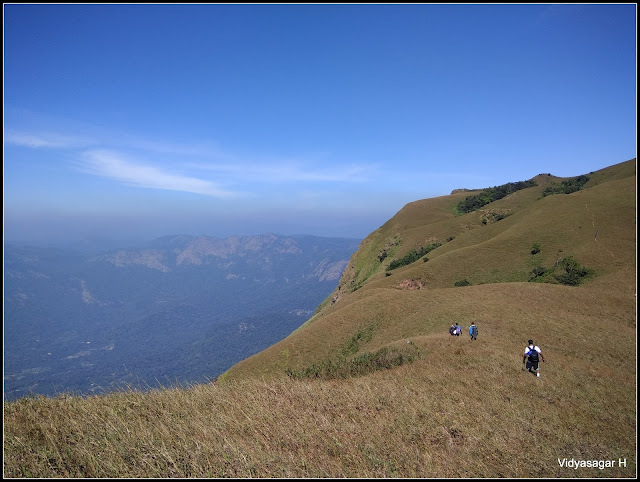 The final stretch of hike is around 100 mtrs which is completely 70 degrees angle. We should be very careful while ascending. I asked the son and better-half to enjoy the valley sitting at lap of the Ettina Bhuja, myself and daughter decided to hike the peak. 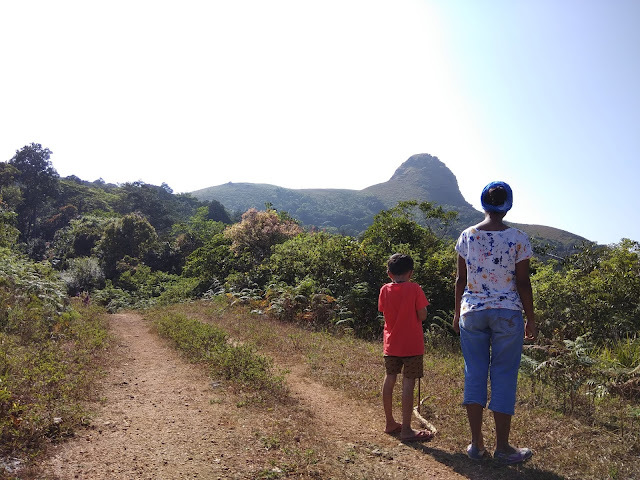 My son stopped us to venture, considering the steep and lonely peak, however we assured him about taking extra care. I and daughter continued the journey and very soon we are on the peak. The cool breeze, the valley, lonely peak is more beautiful. The joy of reaching the peak is unforgettable. 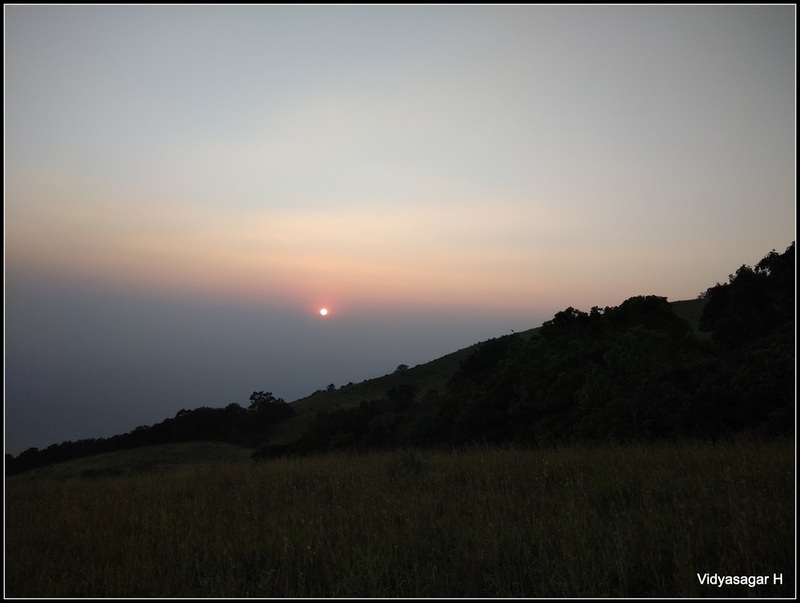 Spent some good time for photography, started the return journey. Descending is very typical, taken extra care. Son is happier about our arrival, we had some snacks on peak. 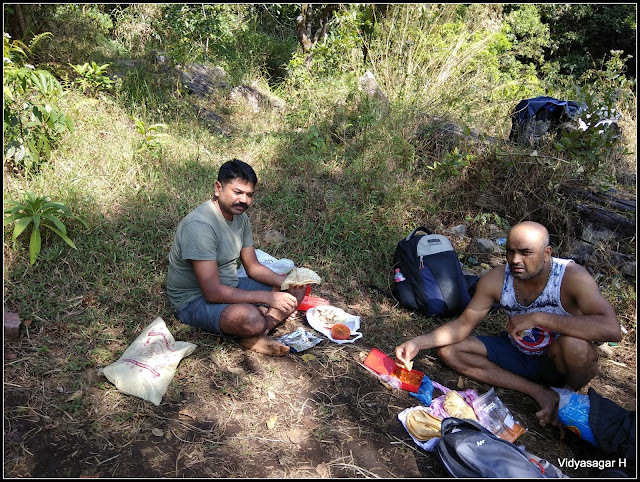 Homemade food was waiting in our backpack, considering the water issue and time constrain, decided to have at temple premises. Relaxed for sometimes. The time was around 4.15 pm. We spent some good time, decided to descend quickly not to take breaks. Very soon, safely reached back to the temple. Filled the home food to our hungry stomach. The time adieu to Ettina Bhuja. Started the journey towards Muniyalu.